This season just ending is one of my favourites because I get to unearth my stitched seasonal treasures and my collection of nutcrackers, angels and snowmen and spread them throughout the house as I decorate our home and enjoy all the Christmas decorations once again for a few short weeks before packing them lovingly away for another year. It is fun to remember when I stitched each ornament or who gave me which treasured ornament. Each decoration must be placed in just the perfect spot to be enjoyed for the holiday season. 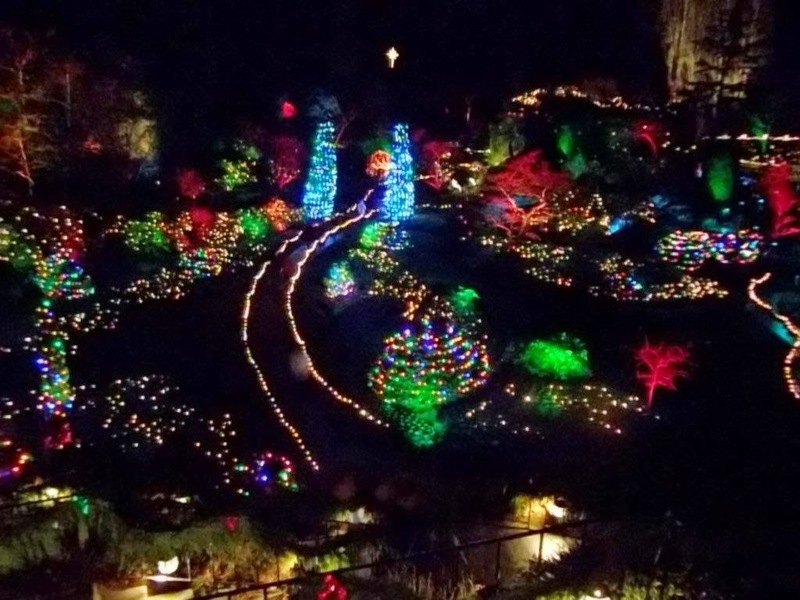 And of course, there is also the annual visit to the Butchart Gardens to see the Christmas light display there. 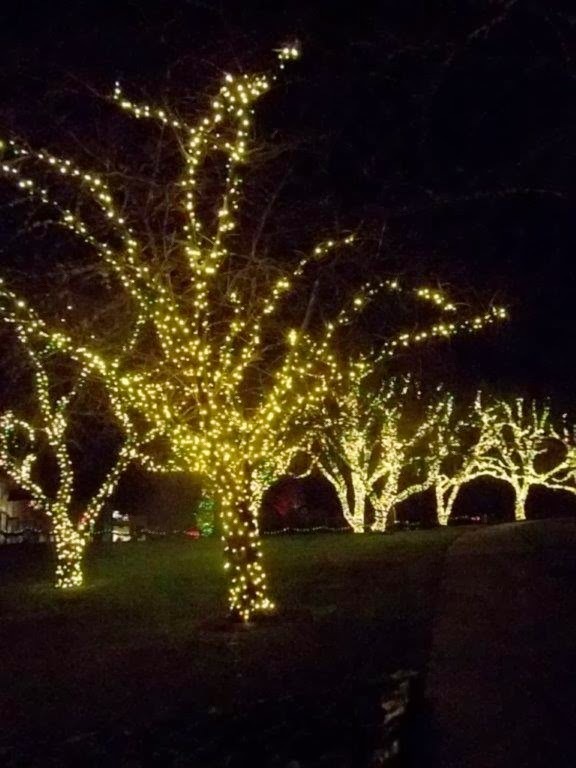 We went out early – still daylight – to have dinner, then in the darkened evening we wandered throughout the gardens enjoying the lights among the various areas of the gardens. 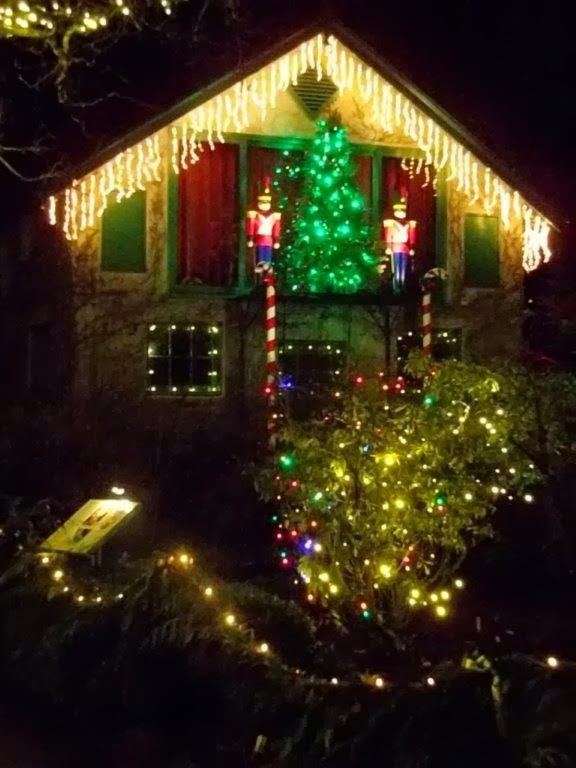 We still look for each of the twelve days of Christmas displays hidden throughout the gardens. 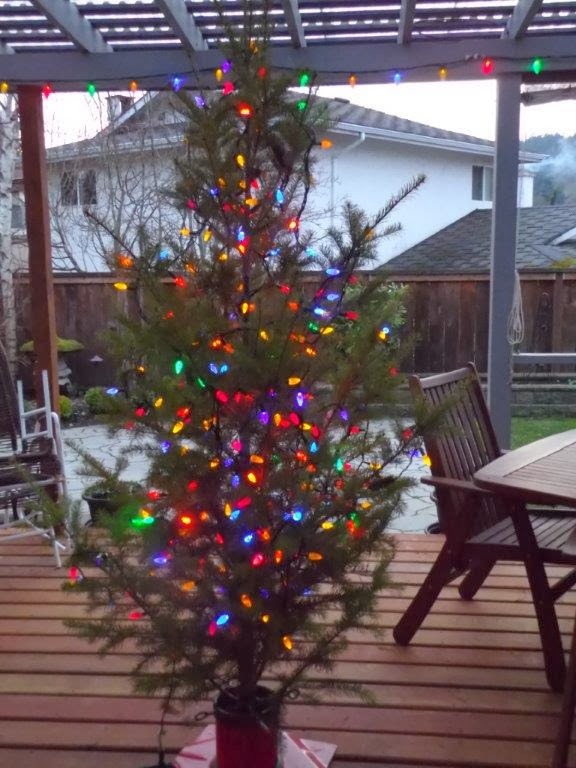 Not too many decorations came out of storage this year, but we did have our usual fresh noble fir – we just put it up on our covered deck and decorated it with many, many coloured lights! Perfect temperature for storing the tree and no one had to worry about watering it while we were away for the 10 days. And the tree greeted us upon our return – no needles falling on the carpet and the lights are still shining brightly outside our dining room door. This year, however, it was a bit different for our family. We met in the middle- my brother, his wife and daughter and his son, daughter-in-law and brand new granddaughter drove from Swift Current, my husband and I drove from Victoria and our daughter flew in from London UK to descend upon our nephew who lives in Calgary. It doesn’t seem like Christmas for me unless I can see snow ( I was born and lived in the Rocky Mountains for nine years) and I got to see my winter snow gently falling as we spent two nights enroute in Fernie visiting my cousins there. 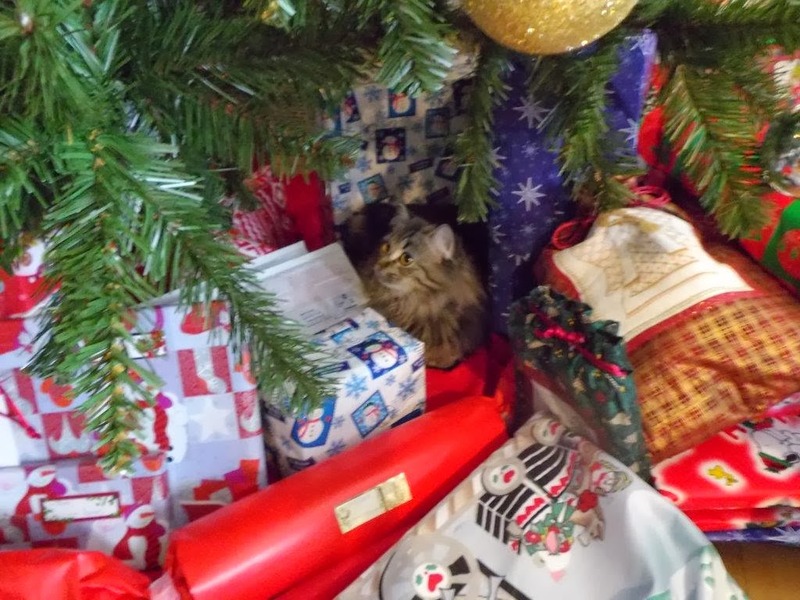 Our time in Calgary was a short visit with the family; we even met the new kitten who came along from Swift Current and spent some time under the Christmas tree among the presents. While in Calgary, I got to visit one of the biggest Christmas decorations I have ever made. 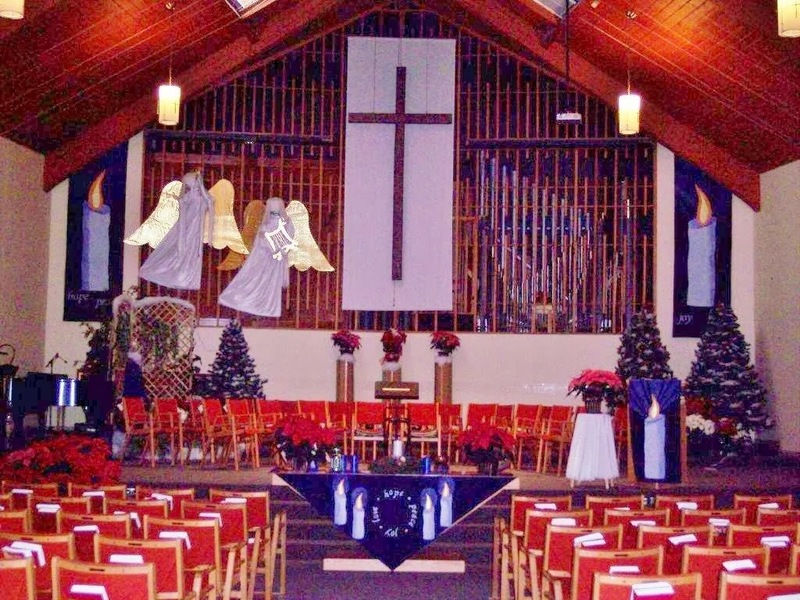 In 2011, I was commissioned by St. David’s United Church in Calgary to create a set of Advent Paraments for the church. There are 6 pieces in the set, ranging in size from 4 inches x 40 inches for the Bible marker to 128 inches (that is ten feet!) x 36 inches for the two long side banners. 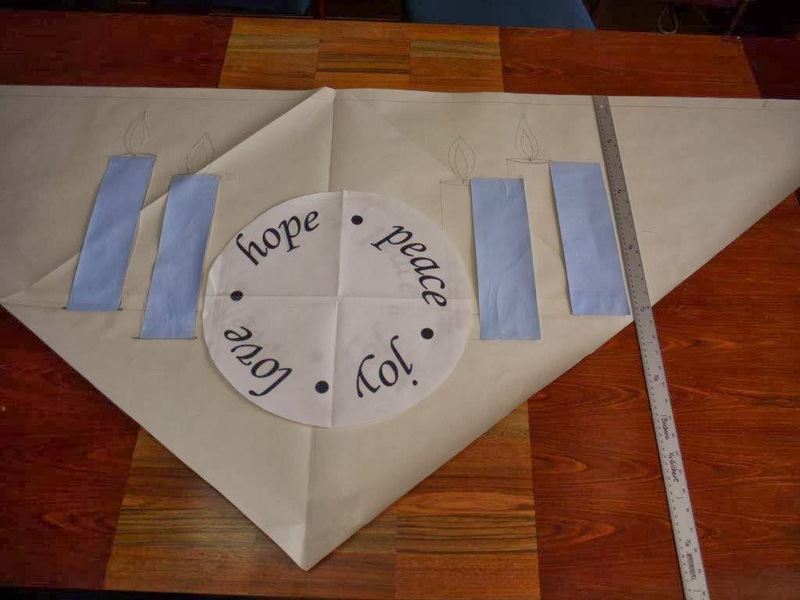 The alter frontal is a triangle shape to match the shape of the table itself. And most days I think it is a great task just to finish off a wee ornament or a needle case; these “ornaments” took many days to finish! I used hand painted silk dupionni for the candles, the lettering and the flames; each was appliqued onto a dark royal blue velvet background. 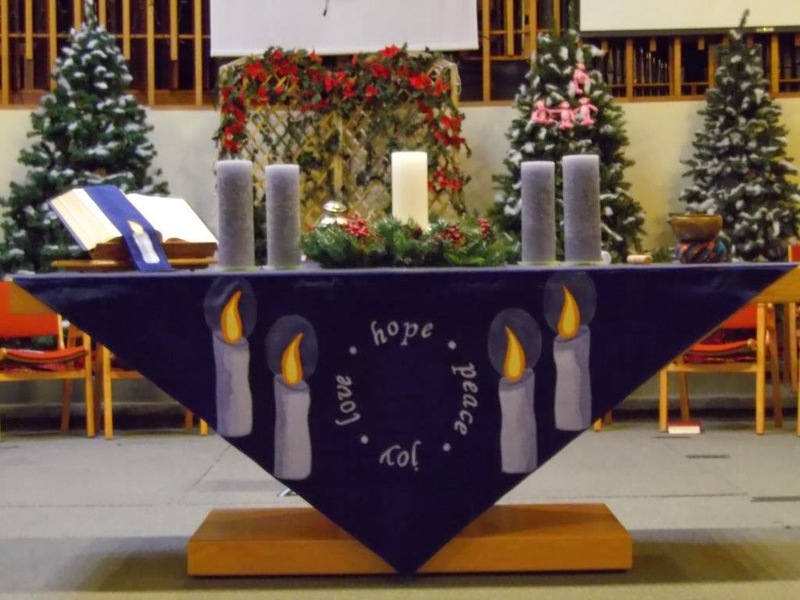 The raw edge of each candle and each letter was couched with a narrow cord. The flames were made using “Shiva paintstiks”. And now, I am going to get to work finishing off the two or three wee small ornaments that I have stitched this past year so I am all set for Christmas 2014! I think January is the best time to stitch Christmas things; it is such a nice feeling to be ahead of the season.